One of the more tedious chores when painting a model is masking off the clear parts of a canopy. I've used latex masking material, Parafilm, Bare Metal Foil and every variety of masking tape known to man. Each method has its advantages, but all require care and precision in application - and even the most carefull work may still result in paint bleeding under the edges, scratches on the clear parts, uneven edges or other flaws. Over the last few years, aircraft modelers have seen a surge of products designed to make this step easier and faster. One of the most popular types of masking aids are press-on masks, precisely cut from sign vinyl to perfectly (in theory) cover every "pane" that should remain clear. 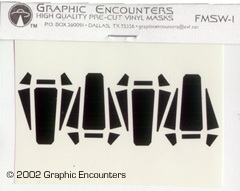 Graphic Encounters has taken this idea and applied it to the recently-released Fine Molds X-Wing and TIE/Fighters. The stock TIE/Fighter includes a pre-marked vinyl sheet from which to cut canopy masks; the X-Wing has nothing. Modelers have been frustrated trying to cut out the TIE masks and precisely match the kit canopy (and of course, the X-Wing requires alternate methods), so the availablity of pre-cut masks is a welcome event. The good news is: these masks fit perfectly. They are paper thin and the edges on all sides exactly fit against the frames of each canopy. There is no bad news. Applying the masks is a lot like applying a decal. You'll need a hobby knife with a reasonably sharp tip, water with a drop or two of liquid dishsoap added, paper towls or a q-tip/cotton bud, and a toothpick or piece of styrene sprue. First, determine where each piece of the mask will go. Now, slide the tip of your hobby knife under a corner of the a piece and gently lift if from the backing. Dip the mask in the water. The backing has a weak adhesive; the soapy water will help overcome this so you can maneuver the mask in place. Position the mask in the area it needs to cover. Be careful to exactly align the edges of the mask with the canopy framing. If the mask sticks before you're quite satisfied with where it's sitting, simply peel it up, dip again, and reposition. Once satisfied with the mask's position, press it in place with a finger. Use a q-tip/cotton bud (or paper towel) to wipe away excess water. Press down against the mask to push any excess out from underneath the vinyl. Finally, take a toothpick (or anything else that's stiff but less hard then the clear styrene, so as not to damage it) and burnish down the edges of the mask. This will ensure you get no bleed-under when you paint. After painting, use a toothpick to gently lift one edge of each masking piece. If you're careful, and don't damage anything, the masks can be re-used once or twice -- at least, that's been my experience with similar products (though given the number of masks Graphics provides, and their inexpensiveness, you don't really need to go to such lengths here!). I left the masks applied to the example canopy in place for over a week before removing, with no problems. Sometimes, with similar products, a little of the adhesive remains behind. In that case, either blot it up by pressing the masking piece against the residue (since the adhesive sticks best to itself) or use something like Goo Gone (a citrus-based adhesive remover available at virtually any supermarket here in the States) to remove it. 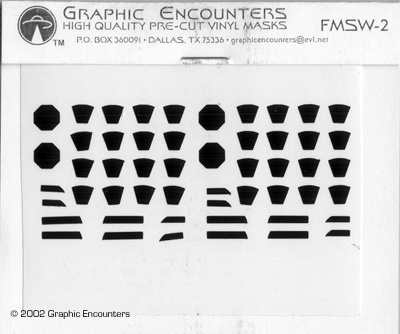 If you can apply a decal, you can use these masks. In my opinion, the minor expense is overwhelmingly justified by the ease of application and the sharpness of the results. Highly recommended for your Fine Molds kits! Many thanks to Graphic Encounters for the review samples. This page copyright © 2002 Starship Modeler. First posted on 11 July 2002. Last updated on 7 September 2004.